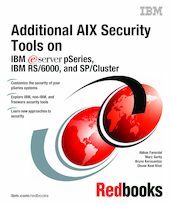 From firewalls to operating system hardening, this IBM Redbooks publication illustrates additional tools and techniques that you can use to enhance the security environment of your IBM eServer pSeries, IBM RS/6000 workstation, SP, or Cluster. The approach taken is from outside to inside and from top to bottom. We move from the servers on the far reaches of your network that are visible to the outside world to those in the innermost recesses of your intranet containing your most confidential data. As we move through these servers, we work from the application layer at the top to the network layer at the bottom. Along the way, we cover third-party software that is readily available, modifications to the standard software that comes with AIX and PSSP, and assorted techniques that can all be used to provide enhanced security in your environment.